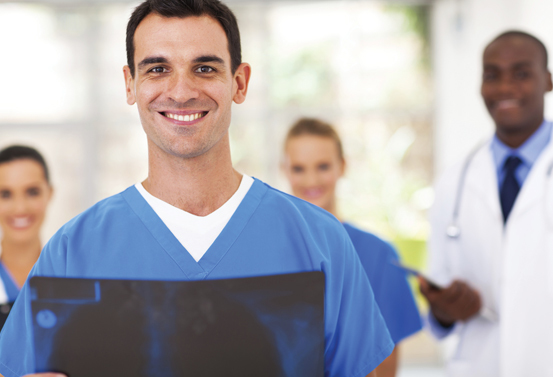 The BSHS program is a full or part time course of study designed to enable students with a previous associate degree in radiography or respiratory care to earn a baccalaureate degree in Health Sciences. This degree program may be completed by other allied health professionals if the original course of study was from an accredited allied health program. The Bachelor of Science in Health Sciences program builds upon previous education and aims to broaden the skill set of the allied health professional. Graduates of the Bachelor of Science in Health Sciences program will be prepared to meet the changing needs of health care institutions in a variety of settings. Additionally, graduates will be prepared to assume leadership responsibilities and effect patient outcomes. Graduates will be prepared to function as collaborative members within the health care team. Knowledge of leadership and management, health provider systems, communication, critical thinking, legal-ethical and teaching-learning principles, evidence-based practice, accounting, and culture care values will be integrated into the Bachelor of Science in Health Sciences curriculum. Students will learn to critique research findings for utilization, study current trends in health care, examine historical and political influences in the health care system, and apply evidence-based research and practices in the clinical setting. Graduates will be educated to demonstrate the knowledge, proficiency, and cultural competence of an educated person, including the ability to synthesize general and professional education into clinical practice. The BSHS degree will further reinforce accountability for life-long learning and professional career development. Graduates will be prepared to practice in diverse health care roles, including leadership and management positions, and provide knowledgeable and competent care across many health care settings. The purpose of the BSHS program is to teach students to apply the contents of scientific inquiry within an ethical, cultural, historical, and philosophical framework. This BS completion program strives to provide students with the opportunity to examine the philosophical foundation, principles, methods, and assumptions of professional scientific disciplines and to explore how these disciplines interact with other disciplines in the provision of evidence-based health care. General education and health science courses are designed to meet the changing needs of health care institutions and to prepare the graduate for leadership responsibilities. Faculty and students partner in a collaborative manner to achieve educational outcomes. Program faculty facilitate this learning process by designing learning methods and environments that are challenging and increasingly complex. Students are responsible for the quality and quantity of effort put forth in the educational endeavor. The career-ladder approach to professional education and practice is one valid choice for students and forms the basis for lifelong learning within the BSHS program.